In February, Mastodon announced that they’d celebrate the 10th anniversary of their 2009 album Crack The Skye on tour later this year. They’ll head out on the road with Coheed And Cambria on The Unheavenly Skye Tour from May, where Brann Dailor, Brent Hinds, Bill Kelliher and Troy Sanders will play the album in its entirety. It should be quite an occasion, but not everyone will be able to see the live show – so the band have decided to release a new range of Crack The Skye merchandise – including a picture disc of the record, t-shirt, jacket, poster and more. In addition, the band have released the first part of a documentary detailing how they made the landmark album. Check it out below. Speaking about the upcoming tour dates, drummer and vocalist Dailor says: “Back in the summer of 2008 when we finished recording Crack The Skye, we felt like we had created something very special. “That is why, to celebrate the 10 year anniversary of one of our proudest moments, we decided to take it out on tour and play it start to finish along with some other golden oldies of course. 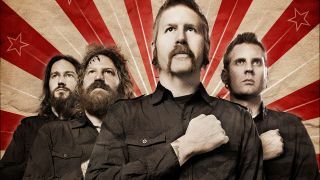 Mastodon and Coheed And Cambria will be joined on the tour by Every Time I Die.